Magnolia Pond is a small but well-established community off north the eastern stretch of Ashton Road abundant with options on Sarasota homes for sale. Its superb south Sarasota location is a popular pick not only for home buyers. This locality has also recently emerged as a hotspot for home builders seeking developable parcels and whose projects eventually help boost market values of Magnolia Pond homes for sale. Their proximity to roads arterial to the Interstate 75 highway running the entire length of Florida makes Magnolia Pond and its neighboring communities amongst the prime destinations for searchers of Sarasota homes for sale. These major road corridors include Clark Road south of Magnolia Pond and Bee Ridge Road to the community’s north; both feature interchanges enabling convenient access to the Interstate. Moreover, the Magnolia Pond locality is just north of the prestigious Palmer Ranch. Besides residential properties, this master development is also host to many upscale country clubs. properties. All these in turn have brought plenty of amenities available to locals and have contributed to home market values to the nearby areas of Palmer Ranch as well. Magnolia Pond was developed as an intimate enclave of just about 60 lots mostly built with pool homes. A deed-restricted community, its major features are two lagoons on the eastern and western sides of Magnolia Point Drive, its main street and access to Ashton Road. Ashton Palms, a newer neighborhood with homes built around 2015–2016, sits directly opposite Magnolia Pond across this road. The homes for sale at Magnolia Pond were built from the late 1990s up to the early 2000s. Though relatively older than those in their neighboring communities, these residences are very well maintained and flaunt many desirable features like split/open floor plans, separate living and family rooms, and formal dining area with eat-in kitchens. As enticing to prospective buyers of Sarasota homes for sale, choice residences in this property offer refreshing water views and superior curb appeal. The community as a whole likewise basks amidst mature and lush landscaping which also serves as buffers to the nearby roads and streets. Its homeowner’ association fees are also quite low, adding to the plus points of Magnolia Pond homes for sale. Given their superb location and lovable features, Magnolia Pond properties are strong candidates as a permanent home or a primary residence. Because of this and the community’s relatively thin home stock, sales listings here are rare and available properties can sell quickly. 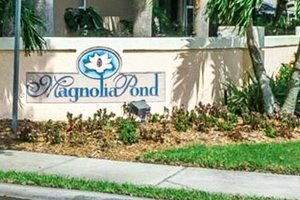 Market activity on Magnolia Pond homes for sale between 2016 and 2017 were deals closed in the high $200s up to the high $400s. These involved residences with floor areas ranging from 1,870 up to 2,650 square feet with three to four bedrooms. Demonstrating the high marketability of the residences in this community, one of its homes was sold in June 2017 after only three days of its market listing. Magnolia Pond draws much of its appeal not only from the amenities in its immediate area which include top-rated schools and hubs for shopping, dining and healthcare. 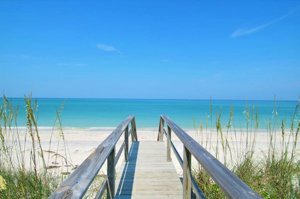 This community is also just a short drive to the Gulf Coast beaches including the pristine white sands of Siesta Key. Below are the current real estate listings available at Magnolia Pond.